Instant Replay Review overturned 3B Umpire Seth Buckminster's out call in the bottom of the 5th inning of the Angels-Mariners game. 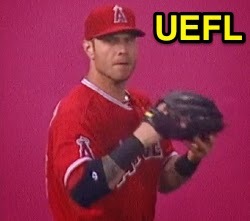 With one out and one on, Mariners batter Corey Hart hit a 3-1 fastball from Angels pitcher Michael Kohn to in the air left fielder Josh Hamilton, whereupon the baseball fell to the ground during the catch and transfer motion. Upon Instant Replay Review as the result of a challenge by Mariners Manager Lloyd McClendon, Buckminster's ruling that Hamilton caught the ball and dropped it after completing the catch and on the transfer was reversed, the call was incorrect. At the time of the review, the Mariners were leading, 4-3. The Mariners ultimately won the contest, 5-3. This is Seth Buckminster (67)'s first Instant Replay Review of 2014. Seth Buckminster is now 0/1 (.000 Affirmation Rate) in Instant Replay Reviews during 2014. Crew Chief Mike Winters' crew is now 2/5 (.400 Affirmation Rate) in Replay Reviews during 2014. This is the 51st Instant Replay Review of the 2014 MLB Regular Season. Mariners Manager Lloyd McClendon is now 1/2 (.500 Success) in Instant Replay Reviews during 2014. Umpires are now 33/51 (.647 Affirmation Rate) in Instant Replay Reviews during the 2014 MLB season.